Old Urbanist: A "Verdict" On Landscape Urbanism? A "Verdict" On Landscape Urbanism? The Landscape Urbanism movement has recently received a lot of attention in urban blogs (here, here and here, for example) as well as the mainstream press — much of it quite critical. There soon may be at least one official verdict on Landscape Urbanist design, however, as a lawsuit is currently proceeding against the city of New York for negligent design of the High Line walkway, which allegedly caused the plaintiff, an elderly woman, to trip and fracture her ankle. At issue in the lawsuit are the peculiar concrete paving blocks, seen at right, which have a slightly upturned edge at path margins, and which taper off into raised, fork-like protrusions. The purpose of this odd design feature? 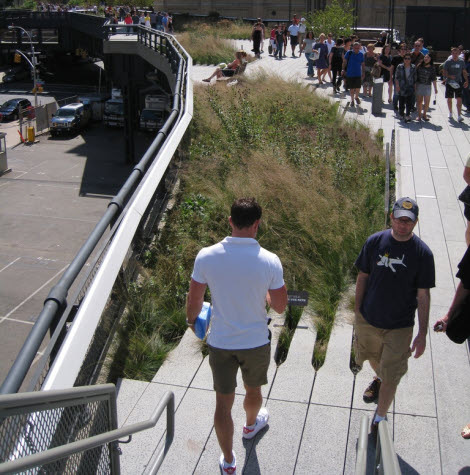 In an essay by James Corner, the Landscape Urbanism proponent who was the lead designer for the project, a similar photo of the High Line is featured with the caption, "a view of hard and organic surfaces bleeding into one," which appears to tie into Landscape Urbanist ideas about breaking down the separateness of the agrarian and the urban. Is it possible then that this design feature reflects purely aesthetic concerns? The raised blocks, however, present a serious tripping hazard, according to Geoffrey Croft of NYC Park Advocates, one that should have been forseeable to designers of the $152 million project. Having walked the High Line myself last September, my impression is that the blocks are a significant hazard, one which is magnified by the excessive narrowness of the pathways and the fact that pedestrians are understandably more interested in observing their surroundings than scrutinizing every step. The staggered, uneven placement of the fork-like elements, as can be seen at upper right in the photo, almost seems designed to promote tripping and stumbling. The city appears to have agreed, as the edges of the blocks are now awkwardly roped off, which adds a degree of safety but which destroys the "bleeding into one" aesthetic. I think this is what happens when a designer lets "making a statement" creep up to the top of the list. What is the primary purpose of a walkway? Walking!